In this noir drama, a successful fiction writer, Richard Harland (Cornel Wilde), meets a young beautiful socialite, Ellen Berent (Gene Tierney) on a train. After a short introduction, the pair falls in love. However, Ellen’s obsessive streak soon becomes evident when she unceremoniously ditches her politically successful fiancée Russell Quinton (Vincent Price) and makes a proposal of marriage to Richard. After their marriage, Ellen’s obsession with Richard mounts to the point where she becomes jealous of her pretty innocent sister Ruth (Jeanne Crain) and even of Richard’s disabled teen brother, Danny. Soon, Ellen finds herself capable of the most malicious and darkest deeds to re-gain the undivided attention of her beloved. 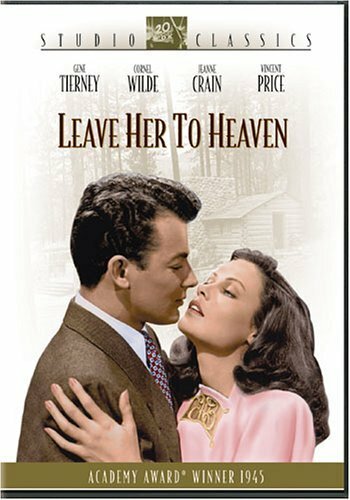 “Leave Her to Heaven”, which won an Academy Award for Best Cinematography in 1945, is based on a novel of the same name by Ben Ames Williams, and the script is written by Jo Swerling, who also did work for “It’s a Wonderful Life” (1946). The narrative of the film flows so naturally it resembles reading a book, and the script is meticulously constructed. Shot in bright technicolor, the film is sometimes very romantic; very often dramatic, and yet at other times resembles a thriller, while culminating in a legal action. The film captures the audience’s attention from the very first scene of a train meeting between the two leads. This scene is important because it displays reasons why Richard becomes attracted to Ellen in the first place, i.e. she is beautiful, intelligent and presents a mystery to him, and why Ellen finds Richard particularly handsome and loveable, i.e. he reminds her of her late father. In this scene, there is a lot of romance, but the scene works because there is some awkward humour thrown into it as well, as the leads interchangeably stare at each other trying to figure each other out. The film has a very interesting character study. Ellen Berent (Harland), played by Gene Tierney, could be described as a psychopath, who does things regardless of consequences or feelings of others, and who is secretive. Despite this, and thanks to the great performance by Tierney, we can still trace thoughts and feelings of Ellen which lead her to commit her gruesome deeds. This constant display of thoughts and feelings by Tierney makes us realise that Ellen is not wholly unlike us and is still very much a human, driven by emotional insecurities and the instinct of self-preservation, perhaps coupled with the desire not to repeat past personal traumas. We see an interesting character development here: from a seemingly kind, intelligent and confident woman devoted to her husband, Ellen turns into an irrational, deeply jealous and obsessive person who will do anything, and remove any obstacle on her way to reach her goal. Of course, Tierney’s outstanding performance contributes greatly to us experiencing this film as some fascinating psychological case study, and Tierney was nominated for an Academy Award in the category of Best Leading Actress for her role. In fact, almost every scene containing Tierney is filled with passionate intensity reminding of Vivien Lee’s winning performance in “Gone with the Wind” (1939). As Scarlett O’Hara, Ellen Berent is more complex and self-interested than she likes to show, and more obsessive and jealous (to the point of unreasonable devotion) regarding her “chosen” man than anyone can guess. Even if “Leave Her to Heaven”’s premise is not very believable, there is hardly any doubt that Tierney makes her character such. Tierney’s character is a typical femme fatal, and we do not have to wonder why Richard is instantly captivated by Ellen, drawn to her beauty and a sense of mystery and mischief she projects. Because of its plot, “Leave Her Heaven” is also reminiscent of the Hitchcockian production in that the film shows off a strong, independent, intelligent woman pursuing her man actively in stark contrast to the projected passivity and mental inferiority of women in films of that decade. Another thing which is captivating in this movie is that “Leave Her to Heaven” did not go for the typical “beautiful blond vs better-than-average brunette” battle. Instead, there are two beautiful intelligent women here competing for the attention of the male lead. Although it can never be said that Jeanne Crain, playing Ruth, outshines Tierney, Ruth appears to be a much nicer, friendlier and more stable in her temperament person than Ellen. The latter is more collected, calm and a more complex personality than Ruth, and it is this contrast which is also very interesting to watch throughout the film. The use of music in the film is also great. The score is almost sinister, creating unsettling atmosphere, subtly telling the audience that beneath the romantic undertones and shots of beautiful nature there lurks something potentially very dark, almost recalling the title of Agatha Christie’s – “Evil Under the Sun”. Wonderful review, I just got this movie on DVD and now I’m really excited to watch it. Thanks, I hope you will like it. I think this movie is more than just a showcase for Tierney. It has this old school cinematography where each shot/scene counts and should be perfect, because you don’t produce 100 films a year like they do nowadays. I always like meticulously made movies and this sounds like one of those. This movie was shot so beautifully that it contrasts so sharply against the more horrifying turns. I will never forget that boat scene when a person is allowed to drown. I agree. And that scene is very memorable, isn’t it? I also love old films like this because casting were so good there. The roles fit the actors so well. I guess before there was a much more rigorous casting process than it is now. Just a thought.